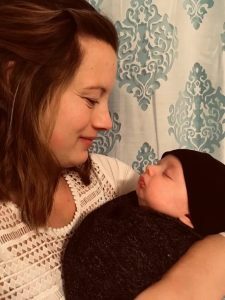 When Ashlyn Aho began the search for a midwife to guide her through the upcoming delivery of her fourth child, she had a list of qualities she desired. She wanted a provider who was caring, knowledgeable and would help Ashlyn feel comfortable and at ease. She found all of that and more in Dawn Dahlgren-Roemmich, certified nurse midwife, at Tri-County Health Care. Midwives offer many benefits to moms including holistic care, personalized education and hands-on service from prenatal to postpartum and beyond. When Ashlyn heard that Dawn specializes in water births, where mothers can go through labor and deliver their babies in a warm-water birthing tub, she was curious and decided to give it a try. “We have a rock-solid water birth program. When Ashlyn came in on Sept. 13, Dawn and the nurses prepped the tub and guided her through labor, which progressed at a steady pace. Her husband, Marlin, was close by her side. Once Ashlyn’s labor pains grew intense, she entered the tub. The warm water helped to take the edge off her pain and allowed her to have some control over her labor, specifically when it came to pushing. Ashlyn’s husband, Marlin, stayed near her and helped to support her back, urging her on and giving her encouragement. Though the delivery was hard work, Ashlyn believes it was less intense than it could have been thanks to the water. About an hour later, Ashlyn and Marlin were holding their son Zayic in their arms. Ashlyn said one of the best parts of the experience was having Dawn as her provider. She was thankful that she had someone that cared and helped her feel comfortable throughout the whole process. Ashlyn plans to continue seeing Dawn for her care. And as for water births, she believes the experience is worth it. 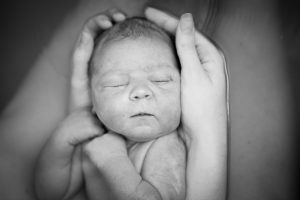 How do I know it is safe for my baby? As a mother, one of your first priorities is the safety of your child. When it comes to that safety, there are no known risks to you or to your baby during a water birth. Research shows no increase of infections in women or babies after labor or birth in water. The tubs are cleaned thoroughly before and after each birth. Your providers will monitor you and your baby closely while you are in the tub. Will my baby breathe underwater? Hormones: In the days leading up to labor, a baby’s breathing activity decreases dramatically because of hormones released by the placenta. Temperature: When babies encounter cool air after birth, their bodies tell them to breathe. Because the water in the tub is kept close to body temperature, they never receive the signal to breathe until they are lifted out of the water. Dive Reflex: Humans have a powerful dive reflex that maximizes their ability to hold their breath underwater. In a baby, that reflex is triggered immediately when it comes into contact with the water. Hypoxia: Babies are born in a state of acute hypoxia, meaning they are temporarily without oxygen. This prevents them from breathing prematurely.